Make the perfect May Day or Mother’s Day basket using our latest craft pattern. This craft requires two triangles either printed or cut out of similar paper. 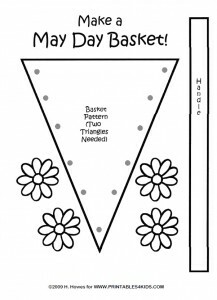 Click on image above to view and print the pattern full size or download the May Day Basket Craft Pattern as a PDF file. Color and cut out two triangles, one handle, and as many flowers as desired. (Print extra daisies). Punch holes along grey circles with a hole punch along both triangles. Use yarn or ribbon to SEW along outside edge of triangle. Do not sew top shut! Add handle of basket to the inside center of triangles. Decorate basket with daisies, glitter, stickers, ribbon, tissue paper, tulle, and fill with candy, real flowers, a letter…or other May Day or Mother’s Day treats.